What is the Nokia D311? How do I send a FAX using Nokia D211/D311? How do I send a FAX using Nokia D211/D311?. Windows FAX) and configure the FAX software so that it uses the Nokia D211/D311 as a modem. How to configure Win fax pro with Nokia D211/D311? How to configure Win fax pro with Nokia D211/D311?. When it opens the "receive", choose "D211/D311 GSM modem" and click on the "automatically answer incoming calls". In the programs setup: choose the "modem and configuration devices" and Nokia D211/D311 GSM modem-"TAPI". If customer use sometimes other devices or modem, he should check the Nokia D211/D311 GSM modem-TAPI is chosen or not. incoming data / FAX calls during active GPRS data connection with D211/D311. Why can I not make any GPRS or GSM connection on D211/D311? Why can I not make any GPRS or GSM connection on D211/D311?. 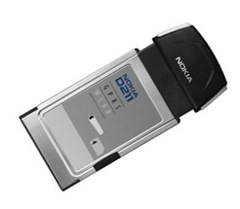 There are no resource conflicts, but the Nokia D211/D311 card still does not work. There are no resource conflicts, but the Nokia D211/D311 card still does not work..
Are their problems with D-link DI-713P AP and 128 WEP key using D211/D311? Are their problems with D-link DI-713P AP and 128 WEP key using D211/D311?. In Windows 98/Me, Network Neighborhood does not show my computer name with D211/D311. How do I contact Nokia Customer Support about my Nokia Wireless LAN Multimode Radio Card? If you are a dealer and need support for the Nokia D-311 , call Nokia Customer Care and access the dealer menu as normal ( 1-888-665-4228 ), then select the appropriate option for D-311 support. The CD-ROM drive cannot be opened during installation. If you think that you might need the operating system files during the installation,it is advisable that you first copy the Nokia D211/D311 installation files to the hard drive of your compatible PC and install the program from there.